1. The isoflavones found in red clover may help to increase HDL cholesterol (the good kind). 2. Red clover is a traditional method of treatment for cough in children. 3. Because of its estrogen-like properties, red clover tea may offer relieve for symptoms of menopause, like hot flashes. 4. Blood-flow appears to be improved by red clover, which acts by thinning the blood and preventing blood clots. 5. Studies on menopausal women who take red clover show that the red clover benefits arterial strength and flexibility. 6. Red clover herb uses extend to the bones, too. Studies show that red clover may increase bone density and slow bone loss in menopausal women. 7. The use of red clover to reverse and/or slow cancer has a long history, and studies show supportive evidence of red clover’s effectiveness as a supplemental cancer therapy. However, because of its estrogen-like qualities, red clover should not be used in the case of breast cancer. 8. Red clover extract side effects are rare and mild, and generally do not occur in users who take it on a short term (less than one year) basis. 9. 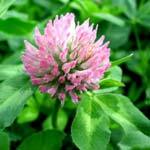 Ointments made from red clover can be spread on the skin to relieve skin rashes, inflammations and irritations. 10. Red clover comes in several forms for easy consumption. There are many possible red clover benefits to be had if you choose to add this herbal supplement to your diet. As always, it is advisable to consult with your physician before making such a change.